We are living in the Golden Age of Jewish art according to art historian Matthew Baigell in his talk at The Jewish Museum several years ago. Contemporary Jewish art of the last 15 years has little in common with previous Jewish American art. Many artists are producing work based on totally different Jewish source materials. In addition, artists groups have popped up in Los Angeles, New York, Chicago and Jerusalem. They are creating their own opportunities and networks, resulting in a groundswell of exciting cutting-edge museum quality exhibitions. 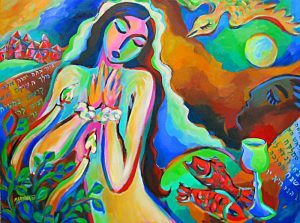 New York artist, and co-founder of the Jewish Art Salon, Yona Verwer, will speak about these developments, illustrated with a slide show. Must register by February 8 to include both lunch and light refreshments. For more info visit our website at http://syjcc.org/index.php/2017-2018-jewish-experience-lunch-learn-series.